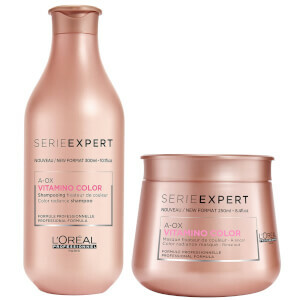 The L'Oréal Professionnel Serie Expert Vitamino Color Shampoo, Conditioner and 10-in-1 Trio will help you to achieve salon-style results from home. Ideal for enhancing and protecting radiance of coloured hair. 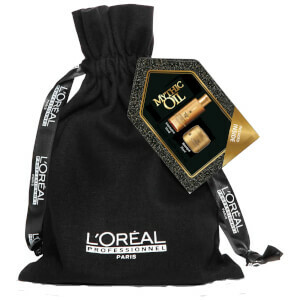 Suitable for colour-treated hair, the luxurious liquid gently removes excess oil, dirt and impurities from your hair and scalp, whilst adding luminous shine to leave hair vibrant and healthy-looking, without weighing it down. Specially formulated with the brand's A:OX technology to deliver a high sheen finish, and enriched with Panthenol to penetrate deeply into the hair shaft to maintain moisture levels. Powered by Panthenol and a vitamin-rich Tocopherol derivative to help enhance shine and preserve colour-treated hair, leaving it vibrant and healthy-looking. The brand's innovative A:OX technology works effectively to improve radiance, whilst delivering intense hydration to promote soft, silky locks from root to tip. Hair feels manageable with a salon-worthy finish. 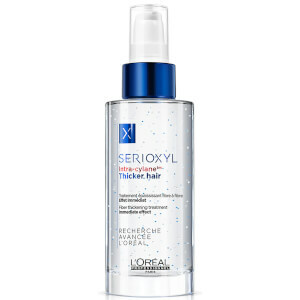 A non-greasy, versatile spray that delivers 10 benefits to improve the hair's texture and appearance. Can be used as a cutting lotion, to detangle hair before colouring, to protect colour and condition locks, or before blow drying to prevent breakage and split ends. Enriched with Fennel Seed Extract and a naturally-derived oil blend to effectively control frizz and leave locks calm and manageable for a smooth, soft and shiny finish. Shampoo: aplique uniformemente no cabelo molhado. Faça espuma e enxague. Em caso de contacto com os olhos, lave-os imediatamente. Condicionador: massaje o produto no cabelo acabado de lavar e molhado, e deixe atuar durante 2 a 3 minutos. Passe bem por água e depois seque; penteie ao seu gosto. Spray: aplique o spray no cabelo lavado e enxuto com a toalha ou ao ar. Penteie sem passar por água.